J’ai beaucoup apprécié lors de votre conférence votre enthousiasme pour votre métier. Merci encore ! Vous avez déjà fait bouger des montagnes dans mon cœur avec votre conférence et votre charisme. Je vous en remercie du fond du cœur. Je suis stupéfait par la pertinence de votre analyse encore une fois. Tout ce que vous soulignez m’aide beaucoup et m’ancre encore plus dans mes décisions. Merci Olivia d’avoir réalisé mon profil astrologique chinois, j’ai été enchantée d’en apprendre autant sur ma personnalité, ma façon de voir la vie et les opportunités qui peuvent se présenter. J’ai été particulièrement frappée par la justesse et la précision des informations. Cela a aussi été une rencontre, un véritable échange qui m’apporte beaucoup de belles choses ! Atelier d’initiation à l’astrologie Chinoise “Ba Zi” à Paris. “La Main du Cœur” 91, rue de Charenton – 75012 Paris. Métro Ledru-Rollin ou Gare de Lyon. Quand ? Du lundi 25 juin au mardi 26 juin 2017, de 9h30 12h30 et 13h30 à 17h30. Un acompte de 30% (60€) est demandé pour valider l’inscription. Vous souhaitez assister à ce stage ou vous renseigner ? Cette initiation se déroule à Paris, les lundi 18 et mardi 19 juin 2018. « La Main du Cœur » – 91, rue de Charenton – 75012 Paris (métro Gare de Lyon ou Ledru Rollin). Quand ? les lundi 18 et mardi 19 juin 2018. Un acompte de 30% (60€) est demandé pour valider la souscription. Voici un merveilleux article sur six maisons de thé qui conjuguent tradition et modernité, beauté et sophistication… N’hésitez pas à parcourir les diaporamas suivants et régalez-vous ! Dating back to the 16th century, the Japanese tea ceremony (chanoyu), also known as the Way of Tea, is an intricately codified ritual in which a host prepares and serves matcha, or powdered green tea, for a number of seated guests. The ceremony typically takes place in a small and intimate tea room, where every detail—from the layout of the interior to the shape of the ceramic bowls—is designed to instill an appreciation for aesthetics and beauty. Historically, these rooms were located in grass-thatched huts surrounded by peaceful gardens, offering a place to withdraw from the material distractions of the world and discover enlightenment in the everyday. Guests and hosts would enter the tea room through separate entrances. Inside, minimal furnishings—tatami floor mats, a sunken stove for heating the tea, spare flower arrangements, and a painted hanging scroll—helped to establish a contemplative mood. Since the 1990s, contemporary architects have approached the challenge of modern teahouse design with an eye toward tradition, adhering to the ideals of simplicity and working on a small scale. But they have also approached them with a spirit of experimentation, evidenced in the following examples, which show a range of fantastical settings and the use of modern materials like glass and plastic. The Teahouse by Kengo Kuma. Photo by Ema Peter. Courtesy of Killeen Communication Strategies. Renowned Japanese designer Kuma created this tea pavilion for the 19th floor of a corporate and residential tower in Vancouver in 2017, on the occasion of a retrospective of his work in the city. Overlooking the bay and the Downtown district, the meditative structure is constructed on a raised wooden platform, which creates the illusion that it is serenely floating above the surrounding stones. Modern, functional additions to the traditional form include sliding glass walls, as well as an interior table on hydraulic supports that can be raised and lowered as needed. Photo by Nicolás Boullosa, via Flickr. Architect Terunobu Fujimori didn’t receive his first commission until age 44, after having worked as an architectural historian for three decades. He has since been widely recognized for his use of raw, natural materials and his strikingly playful and eccentric designs—including this “Too-High Tea House” in his father’s backyard in Nagano, Japan. Built on two 20-feet-tall chestnut trees, the house—which looks like it came straight out of a Miyazaki fairy tale—can only be accessed by climbing a ladder. Inside, a large window frames a scenic vista of his hometown. Designed by Chinese architect Sun Wei, this modern bamboo teahouse is located on a lake in the ShiQiao garden in Yangzhou, China. Largely constructed of bamboo, it is divided into an asymmetrical maze of outdoor corridors and smaller courtyard spaces, which open into both interior and exterior views of the lake. The verticality and weightless quality of the design are accentuated at night, when the teahouse lights up and illuminates the lake. Photo by @duzettdistrict, via Instagram. Photo by @yolandebatteau, via Instagram. Czech architect David Maštálka collaborated with sculptor Vojtech Bilisic on this teahouse, located in a picturesque garden at the bottom of a hill in Prague. Inspired by the Japanese tradition, Maštálka envisioned “a world hidden inside, where time flows at its own pace, a vacant space leaving an impression just by its spaciousness.” A matted circular platform opens out to the garden on one side. And its translucent domed roof represents the sky, while the hearth represents the home. This temporary tea house honors Furuta Oribe, the legendary daimyo tea master who championed the use of rustic, amorphously shaped bowls in his ceremonies. Made of plastic corrugated boards, which are typically used for shipping boxes, and adjoined with plastic bands, the room can easily be disassembled and transported, as it was for Design Miami/ in 2015. 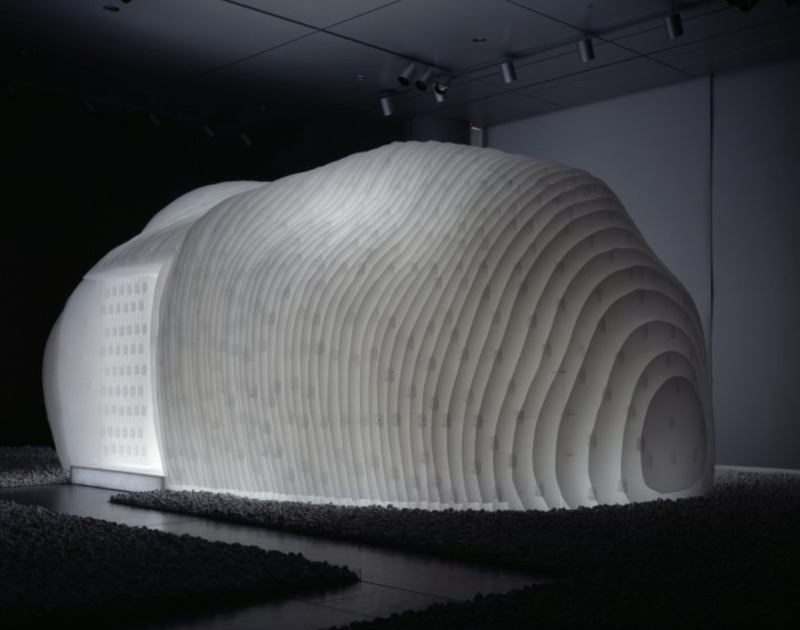 The cocoon-shaped hut can appear solid or transparent depending on where you stand, while inside, visitors find a quiet, tranquil space aglow with soft light.